Investigate the disappearances in Narsis. Narsis — Find the missing villagers from Narsis. The threat of the Llodos plague has allowed paranoia to run rampant. Many people in Narsis claim that friends and family members have vanished in the night. Talk to Councilor Ralden in the Hlaalu Kinhouse. (Optional) Talk to the Narsis townspeople. Search Eastern, Western and Southern Narsis for clues. Speaking to Sergeant Ren in Narsis reveals that some of the villagers might have been "stolen" in the middle of the night. You offer to talk to the house leaders at the kinhouse. Dala Marys is standing outside, tending a cart near the Merchants' Stall. 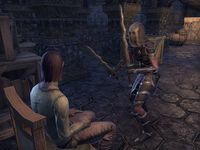 She says the guards aren't searching for the missing family members because House Hlaalu's council members didn't tell them to. They only seem concerned with the plague. Halyen Thunder-Fury is not too far from her, sitting by the fire near the stall. He's concerned about getting the plague because he won't be able to fight it. He doubts the house leaders will be able to save the city. Deron Senelu is smithing on the east side of town, near his house. He says that people are leaving Narsis in waves because they're afraid of the plague, and rightly so. Councilor Ralden is inside the Hlaalu Kinhouse. He says his friend Giron had the guards look into the disappearances. No one has seen any of the missing people leave Narsis. You offer to look into the disappearances, and Ralden hires you. Speaking to him more reveals that Giron wants to seal off the city to protect it. Ralden disagrees because Narsis is a trade center, although he admits recent events have caused a drop in visitors. He doesn't know what to do. There are three areas of Narsis to search: the south, the east and the west. On the west side of, you talk to Dala Marys. She is looking for her husband, Evis, who was dealing with a botched delivery before he disappeared. He is in Varlas House to the west being interrogated by Naryu Virian. She reveals that she and her associates have tracked shipments of Llodos plague into Narsis, but they don't know what happened after they arrived. Depending on how you react to her, she will either disappear in a cloud of smoke, leaving a letter to Evis behind, or she will give you the letter and continue to interrogate Evis. The letter mentions crates and someone called Vox. Intimidate Evis, and he will give you more information. The shipment contained something for the Maulborn camped outside the town. Maulborn Rogue: "You're looking into matters that don't concern you, outsider." Dispatch the thug and continue your investigation. In Sadri House, in the southern area of Narsis just across the street from the kinhouse, you can talk to a sweeping Dunmer named Anila. She is talking to herself about shipments. Her master is a writer and keeps a journal. Up the stairs behind Anila, in the room to the left, is an anonymous journal. The journal refers to Vox, putting the plague in wells and needing more bodies, which Narsis will provide. You should return to Councilor Ralden to tell him of your discoveries. The Councilor decides to close off the city. A House Hlaalu guard informed me that if I want to offer my help, I need to speak to a councilor at the kinhouse. Councilor Ralden of House Hlaalu hired me to investigate the truth behind the disappearances. I should search around town and speak to anyone who might know what's going on. Perhaps I can discover something the guards missed. Finishes quest I gathered information about the disappearances, including evidence linked to the Llodos plague. I should return to the kinhouse and talk to Councilor Ralden about this. This page was last modified on 15 March 2019, at 18:12.